When the announcement was made recently that Tony Nominee Norm Lewis was slated to make history as the first African American to play the lead role in Phantom of the Opera on Broadway, I found out because my theater-nerd students were ecstatically posting about it on Facebook. When we first considered doing Les Misérables at Bronx Prep, our musical director Geoffrey Kiorpes and my co-director Denisse Polanco and I didn’t actually think it would fly. But the problem with Les Mis had nothing to do with having an African American girl play Cosette or a Latino guy play Jean Valjean. We were just worried that teenagers from the South Bronx might have a hard time envisioning themselves in an operetta about revolutionaries set in 19th century France. Would teenagers at our school be willing to audition for a show with a musical style and historical context so different from what they know? And would watching YouTube clips of traditionally cast (i.e. most) versions of Les Mis reinforce their beliefs in the show’s inaccessibility? It was while I was watching the DVD of the 25th anniversary concert version of Les Mis back in January of 2011 that a one-two punch of “ah-ha” moments—the first inspiring and the second deeply disappointing—ultimately convinced me that we had to try to put on the show at Bronx Prep. The first moment came toward the beginning of the first act, when Norm Lewis bursts out onto the stage in the role of Javert, his rich baritone booming out the character’s iconic first line, “Now bring me prisoner 24601!” The impact of Lewis’s command of the role was so visceral I almost leapt up off the couch. My excitement built through the rest of the performance, but it was a second moment—this one entirely uninspiring—toward the end of the DVD that cemented the decision. At the very end of the concert, after the massive crowd in London’s O2 arena has been reduced to tears by an encore performance of “Bring Him Home” by a quartet of actors who have played Jean Valjean over the course of the show’s 25 year history, producer Cameron MacIntosh steps forward to bring this generational torch-passing to its final conclusion by announcing a procession of school children representing the students all over the world who, thanks to Musical Theater International’s release of Les Misérables School Edition, will be carrying the Les Mis legacy into the future. The audience goes, “Ohhhhh,” and—I admit it—I was already tearing up before those kids even marched onto the screen. But then they pour into the stadium, these throngs of adorable, passionate students parading through the aisles in full costume, waving red flags and singing “The People’s Song” at the top of their lungs—and little by little it begins to dawn on me that I’m not seeing anyone who looks like the students I teach. Not a single kid. I lean closer to the TV, waiting and watching until the very end, when the camera pans back to the actors on stage and the confetti bursts from the ceiling and the shot dissolves to the audience members weeping and cheering. But in the entire procession—and I’ve re-watched recordings of the concert on YouTube from different nights and from different angles—there is not a single child who is not white. We announced the show at Bronx Prep a few weeks later. As we’d feared, most of the kids who had assembled in the hallway for the big unveiling stood around afterwards, bewildered and disappointed. What was this stuffy, unpronounceable French-sounding musical anyway? But we were prepared. The next day Denisse and I held a Les Mis information session. Most of the kids slumped into the classroom and horsed around in the back while we summarized the plot. But the moment we showed them snippets from the 25th Anniversary Concert DVD and the kids saw Norm Lewis making his entrance as Javert, they sat straight up in their seats, eyes lit up. This was the moment Les Mis fever officially took hold at Bronx Prep. It built steadily over the next few months as kids made deep, personal connections to the show’s themes of social justice, unconditional love, protest and redemption, and it culminated in one of the most well-received productions we’ve ever put on at Bronx Prep. Some critics argue that casting performers of races and genders other than what the script specifies actually masks deeper issues of racial and gender equality with quick, politically-correct fixes that have the potential to seem awkward, anachronistic and distracting. Others go further still, suggesting that non-traditional casting diverts energy that would be better spent working to ensure that more playwrights and directors of all races and genders are making work that speaks directly to the fullest spectrum of our nation’s diversity. awkward, anachronistic and distracting moments on stage than support an art form that keeps the upper echelons of its professional ranks closed off to performers of color. As for the second argument: if the outpouring of enthusiasm from our students and school community around the following year’s production of “In the Heights” was any indication, it’s clear that there’s a real hunger on the part of diverse young audiences for Broadway shows that speak directly to their experiences. But the ONLY way we will move into a future where Broadway represents the work of directors, producers and performers of all genders, religions, and socio-economic backgrounds telling stories that speak to equally diverse audiences is to ensure that kids coming up in schools today get to see people who look like them playing lead roles—and not just traditionally “ethnic” roles, but the leading roles in the classic works of the musical theater cannon. Participating in the arts is, in my mind, a fundamental human right. But, as efforts to close the achievement gap make clear, it’s not enough to provide all students with access to a rich and stimulating education. It’s equally important to make sure that they also have role models from their own communities and backgrounds who are paving the way and showing them what’s possible. All photos by Alejandro Duran at The Digital Project. 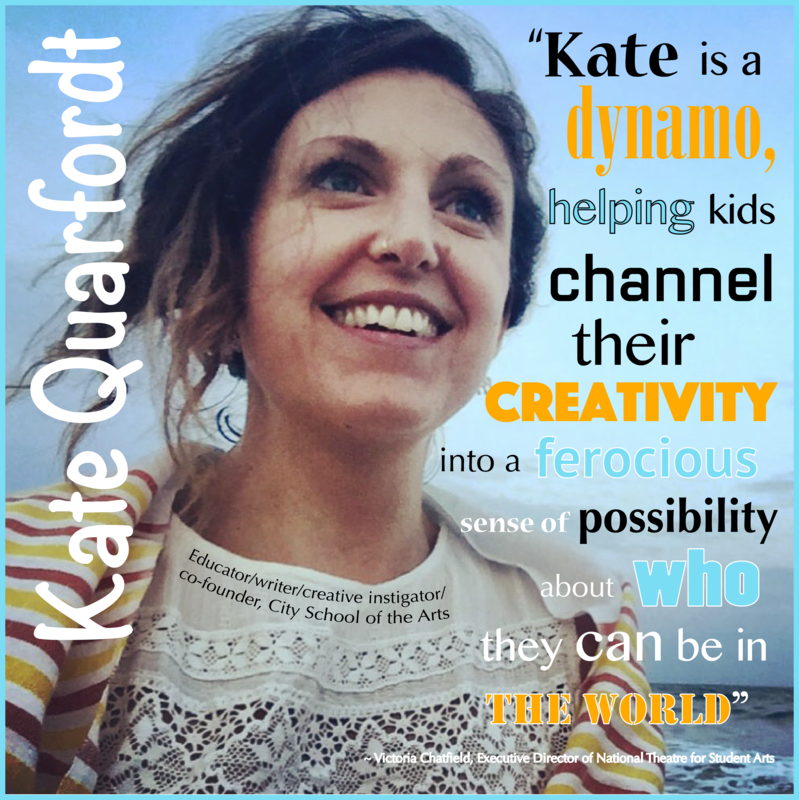 ~~~Kate Quarfordt is an educator, writer, director, artist, mama and all-around creative instigator. She is currently at work on a memoir about her ten years teaching musical theater at a school in the South Bronx. 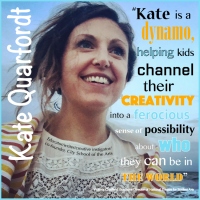 Posted in Braving Storms, Good Ideas, Inspiration, Writing and tagged braving storms, Kate Quarfordt, teaching.